On this page, we look at Sky Anytime, and the new Sky Anytime+ services. These offer on-demand video from your Sky+ set-top box. Sky Anytime started rolling out to Sky+HD boxes in the first half of 2007, and is also available on newer Sky+ boxes. 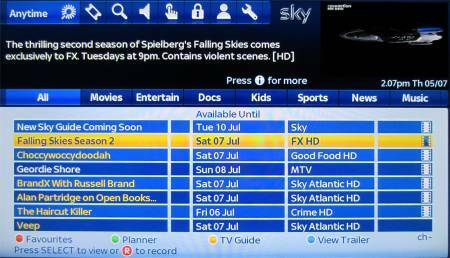 The Anytime service uses space on the Sky box’s hard disk, and captures a selection of Sky TV programmes and movies that are downloaded to the box overnight. This means that there’s always a selection of programmes ready to watch on-demand. Sky Anytime is available from the “Anytime” option on the Services button of your Sky remote. Shows recorded on Anytime delete themselves after a number of days, to free space for other Anytime programmes. If you want to keep an Anytime show, you can use the ‘R’ button to move it to your standard recordings list. 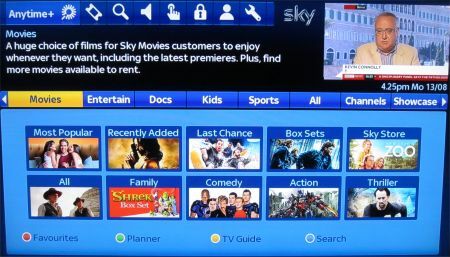 Sky Anytime is not available on older Sky+ boxes (the early models had smaller hard drives). Sky Anytime is a free service for Sky+ / Sky+HD subscribers. This service launched in October 2010, offering video-on-demand over the Internet on your Sky+HD box. Sky Anytime+ offers over 500 movies and a large collection of TV shows that can be viewed on-demand. Note: Downloads via Sky Anytime+ count towards your monthly broadband download allowance (unlike BT Vision‘s service where on-demand content doesn’t eat into your allowance). Sky+ Anytime was rolled out across the UK to Sky users between October 2010 and January 2011. To use Sky Anytime+, you’ll need to connect to your broadband router either using the Ethernet socket on the back of the Sky+HD box, or get the optional wireless adapter. Q. How much bandwidth is required for Sky Anytime+? If your Sky Broadband connection gives you a line speed of 2Mbps or more, you can start watching a show “within minutes” of selecting it. If your speed is below 2Mbps, downloading will take longer. The content will still download, just slowly, meaning you may have to wait a while before the content is downloaded and you can start watching. You also seem to have a problem with the caps lock key. better call 911, now, it can be serious.